Writing is second nature to most of us who live in literate societies; so we hardly ever stop and think about what the alphabet is, the tool with which we write. If we do so, however, we would realize that the alphabet is one of the most widespread and powerful tools of communication ever invented. The alphabet is a device; in many respects it is the mother of many other advanced inventions that have enhanced the speed of human progress. Over two billion people throughout the world today use one form or another of the alphabet for reading, writing, recording, various forms of art and communication, and expressing ideas and emotions. If writing is an important human tool, how much more is the alphabet, which makes writing easier and more accessible. What is the alphabet and how is it different from other forms of writing? When, how, and by whom was it invented? How was it transmitted from its birthplace in the ancient Near East to the West? Even though the modes of writing have evolved from the age of manuscript copying to the age of printing and typing to modern word processing, why does the alphabet remain the unchangeable instrument of literacy and communication? What is the Ethiopic/Ge'ez alphabet, which we use today, and how is it related to the original Semitic alphabet? These are the ideas that we shall consider here. Every word that we utter can be written individually and separately with pictographs and ideographs. But imagine how many pictures and idea-pictures we would have to draw to write! Ancient Egyptian (c.3000 BCE), Sumerian (c.3000 BCE), Proto-Indic (c.2200 BCE), Hittite, (c.1500 BCE), Chinese (c.1300), Mayan, and other ancient forms of writing were based on word-pictures, idea-pictures, or word-syllabic-pictures. To write or read ancient Egyptian and Sumerian, the oldest known forms of organized writing, a person has to know about 700 or 600 symbols respectively (signs representing both words and syllables.) In Chinese, one has to know about 3000 symbols. Not only is the process of democratic education and literacy practically difficult with such forms of writing, but also even systematic and efficient functions of writing can become tedious, time consuming, and cumbersome for the brave few who become literate after years of learning and practicing. Imagine reading the Bible, Tolstoy's War and Peace, or Victor Hugo's Les Miserables in hieroglyphs in bed, on the bus or the train. I understand that finding a person's name in a Chinese telephone book, without additional oral information and assistance, could take up to one week. As compared to the burdensome pictographic and ideographic forms of writing, the alphabet is a breathtakingly simple system of symbols for phonetic sounds. And all scholars agree that it was invented only once! Humans talk endlessly-- speak and lecture, chatter and gossip, argue or admonish, pray or preach, whisper, shout or sing. To do so we use several thousand words, but, amazingly, only a limited number of phonemes or sound units-- about thirty more or less in most known languages! No matter how much or how long we speak in any language, our vocal systems-- our mouths, tongues, vocal chords-- repeat the same thirty or so sounds over and over and over again. The inventors of the alphabet were the first to harness this amazing phenomenon. The ancient Egyptians might have been the first to recognize the phonetic phenomenon. In fact, they had what some call a pseudo-alphabet. They used signs representing consonants. But, they never used the signs independent of bilateral and trilateral pictographic or ideographic signs. Egyptian writing remained always a word-syllabic system. In other words, the Egyptians never freed their writing system from pictographs and ideographs. The inventors of the alphabet did exactly that: they freed writing from multilateral pictographs and ideographs. To be sure, they must have been knowledgeable with the Egyptian hieroglyphic system of writing from which they seem to borrow some of their pictographic symbols on which they built the alphabet. Instead of using pictures directly for writing words, ideas, or syllables, the inventors of the alphabet selected about twenty-seven pictures and designated them as symbols for writing acrostically the phonemes (speech sounds) of their Semitic language. The invention of the system took place no later than the 18th BCE. The system was a wholly phonetic one, each sign representing a single consonantal phoneme. To achieve this they organized the pictures acrophonically, that is, according to their initial phonemes (sounds) or tones. For example, they selected 'alf meaning "ox" in their Semitic language to designate the sound "a" and bet meaning "house" to represent the sound "b". That is why our Ethiopia 'a or the Roman capital A look like the head of an "ox", especially if we turn it upside down; and Ethiopic b or Roman capital B a hut. We call our writing system alphabet after the first two Semitic words for "ox" and "house". Interestingly the fixed order that the inventors created survives to this day with little change in almost all the languages that adopted the alphabet, including the Roman script from which the English script evolves. In 1905, Sir Flinders Petrie found at Serabit el Khadem in the Sinai Peninsula a dozen short texts inscribed in an unknown pictographic script now called Proto-Sinaitic. He dated them to about 1500 BCE. The Harvard Expeditions in 1927, 1930, and 1935 greatly expanded the corpus of Proto - Sinaitic texts. Sir Alan Gardner took the first steps of decipherment in 1971. He noted a recurrent series of signs going - oxgoad-house-eye-oxgoadcross, followed by and acrophonic principle. Gardiner's decipherment and the other attempts to do so have more or less settled the 40 years debate - for instance, were the names primary, part of the invention of the alphabet or secondary mnemonic devices -- as to how the alphabet was devised. Some questions still exist however. Other important discoveries bearing on the alphabetic origins have been made. 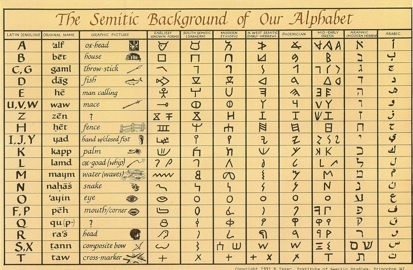 It is thought that an alphabetic system based on old Canaanite pictographic alphabet also existed. Beginning in 1929, a series of magnificent epigraphic inscriptions were discovered in Ugarit, on the coast of Syria. The main group of texts contained epic and mythological works inscribed in a cuneiform alphabet in an early Canaanite dialect of the 14th century BCE. Scholars now believe that this alphabet, called the Canaanite-cuneiform alphabet, was used throughout Syria-Palestine. This was shown when an Ugaritic abcdiaris were discovered, first published 1957. One group lists alphabetic signs following precise order that survives in Hebrew and Aramaic, and Greek. Another abcdiary lists the signs of the Ugaritic alphabet in order and adds Babylonian signs, which allows us to reconstruct the names of the letters of the alphabet in the 14th century BCE. These names alp, bet, gaml are ancestral to the Phoenician and Greek names. The Ugaritic texts confirm other evidence that the names of the old Canaanite signs and their order are at least as old as the 14th century BCE. 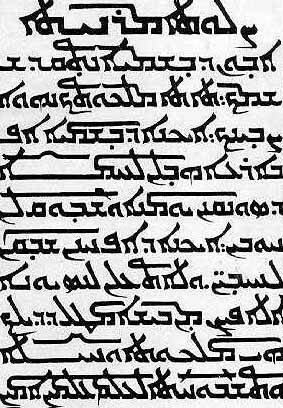 The acrophonic principle, integral to the names of the signs, went back to the invention of the script. In sum, we have a steady accumulation of early alphabetic inscriptions which now can be classified under two headings: Old Canaanite, transparently pictographic in origin, found in Syria-Palestine, belonging to the same genre as the pictographic script of Sinai; and Linear Phoenician inscriptions, easily read, an alphabetic script which is an ancestor of the Hebrew, Aramaic, and Greek scripts. We now recognize clearly for the first time certain features of the two styles of alphabetic writing. The Old Canaanite alphabets were multidirectional: horizontally right to left, left to right, and vertically, and boustrophedon. In Linear Phoenician the direction was fixed: right to left horizontal writing was standardized and the stance of letters becomes fixed. On the El-Khader arrowheads and the older Canaanite system letter/pictographic faced out from the direction of writing. The Greek script was borrowed from before the standardization of direction and stance. Early Greek was multi-directional and indeed standardized in horizontal left to right writing. Generally therefore Greek letters face in the opposite direction from Phoenician.